The Sejm - the lower chamber of the Polish parliament. 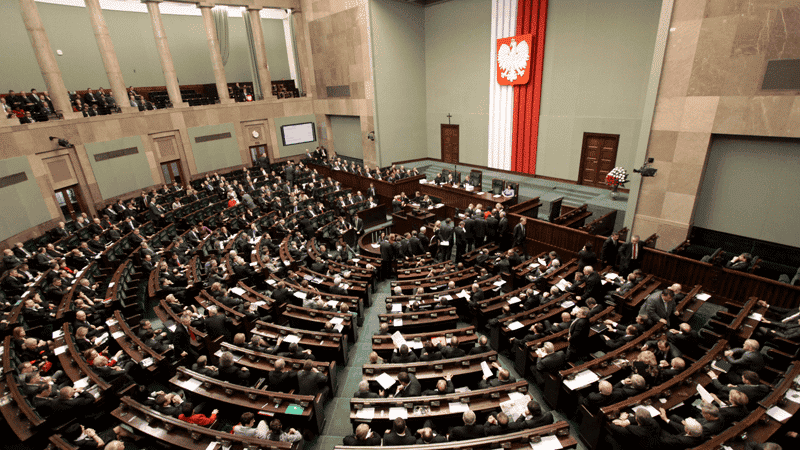 The Polish government has been reprimanded by the European Union for its plan to introduce pro-life legislation. Polish ministers are pressing ahead with plans to change the law to protect unborn children with disabilities from being aborted. The EU claims the proposals represent a “serious breach of European values”. Despite the proposals receiving support from 830,000 Poles in a petition delivered to the Polish government, the European Parliament said that if plans proceed it may suspend Poland’s EU Council voting rights. Hungary’s Deputy Prime Minister Zsolt Semjén described the EU’s move as “unprecedented”. The Roman Catholic Church is backing the legislation which is expected to be introduced early this year. One bishop, Pawel Rytel-Andrianik, said: “The Polish bishops’ conference underlines that the right to life is fundamental to every human being, so we should all protect this right for defenceless children”. Rytel-Andrianik said the current law “doesn’t protect human life sufficiently” because it allows the abortion of unborn children with a disability, adding “in 90 per cent of cases this refers to children with Down’s syndrome”.